For the driving enthusiast, high speed, canyon curves, and hard braking are all a part of the Mazda drives that we love. This means everything on the vehicle must work harder to do the job it was designed for; sometimes those parts just are not up to the task. This results in clunking, rattles, or even a complete part failure that could have been prevented. We know you love to drive your Mazda hard so we put together a kit to keep your performance exhaust in place and in check while you fly up the mountain, slide around a cone, or hit that perfect apex. Fitment for 2014+ Mazda3, 2013-2017 Mazda6, and 2013+ CX-5. #ZoomZoom! Check out the video below, and share your performance review with the CorkSport community once installed! The CorkSport exhaust hangers utilize firmer polyurethane rubber measured at 75A durometer vs the OE rubber hangers of 50-55A durometer. The stiffer polyurethane restrains the exhaust while allowing for just enough flex and movement in the system to not cause stresses which lead to cracks. 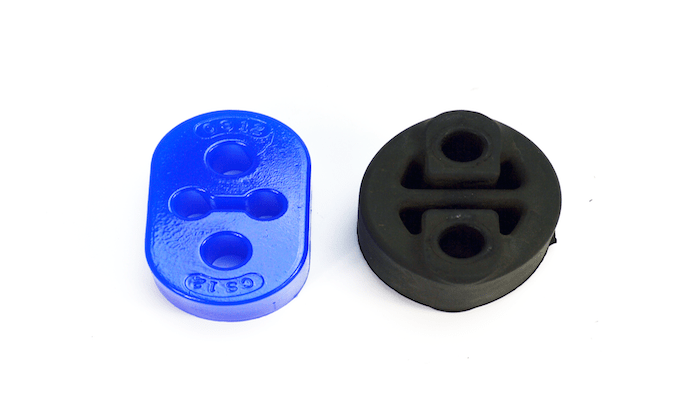 Polyurethane is not your typical rubber; it’s durable, heat resistant, and will look great for years to come, outlasting the typical OE rubber hanger. Made in America: Designed in Vancouver, Washington, in the Pacific Northwest. CorkSport Service & Support: Receive a 2 year warranty, full color installation instructions, all of the needed installation hardware, and knowledgeable telephone installation support. 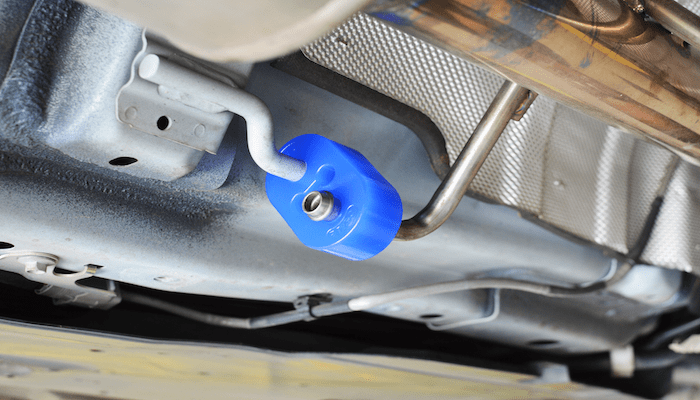 Fitment: The CorkSport Exhaust Hanger Kit fits the following models when using the CorkSport Performance Axle-Back and/or Cat-Back Exhaust Systems. If you are using an exhaust system that utilizes all four hangers for the axle-back section please contact CorkSport to include an additional two hangers in your kit. It will take you two hours to install the CorkSport Polyurethane Exhaust Hanger Kit with our easy-to-use instructions. These were very easy to install. A little bit of lubricant will help take the old ones off. Once installed I noticed the exhaust tone was a little better. The vibrations caused by the rear motor mount were also reduced slightly but enough to make a difference. Good product. Will definitely CorkSport again. If you have a catback-exhaust and rear motor mount installed to your 2014+ Mazda 3, get this...As a sedan owner, I welded in longer exhaust tips to the already catback and installed the mount, but with that comes that annoying rattling sound. Installing the crankshaft pulley will help, but once you install the exhaust hangers as well, you'll be very pleased. Try driving your car very aggressively and in sport mode. You'd want to give yourself a "pat on back" for a job well done.